Dakshayani is one among the numerous names of Mother Goddess Shakti. Goddess Sati is known as Dakshayani. She is known by the name because she was the daughter of Daksha Prajapati. 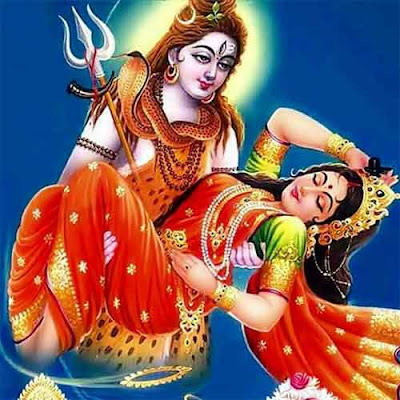 Goddess Sati had married Shiva against the wishes of her father Daksha. Daksha once planned to perform an important yajna. He invited everybody but Shiva and Sati was not invited. Sati considered this as an insult. Sati wanted to find out why Mahadev was not invited to the yajna. Shiva advised Her against going to an uninvited yajna. Dakshayani ignored the warning of Shiva by telling him that she need not need an invitation to visit her father's house. Shiva gave permission to Sati to attend the yajna. Dakshayani and her aide, Somanandi, and countless Ganas set out from Kailash. Upon reaching the yajna spot, Dakshayani greeted her father. But She was insulted by Daksha. An arrogant Daksha asked her to return quickly to her half-naked husband living in the cremation ground. Dakshyani interrupted Daksha to remind him that he can insult her as she is his daughter but She will not tolerate any kind of insult of Shiva, who is flawless. Sati was filled with anger and sorrow. She declared that she cannot remain in this body which is the result of her father Daksha. She announced that she can longer bear to be called Dakshayani. She then self immolated. Dakshayani is Goddess Sati. She is dark in color. She is daughter, devoted wife and fierce Kali.